Caleigh Doan is the first recipient of the Mid-Ohio Valley Safety Council Scholarship Program. She was presented a $500 check to apply towards her continuing education. 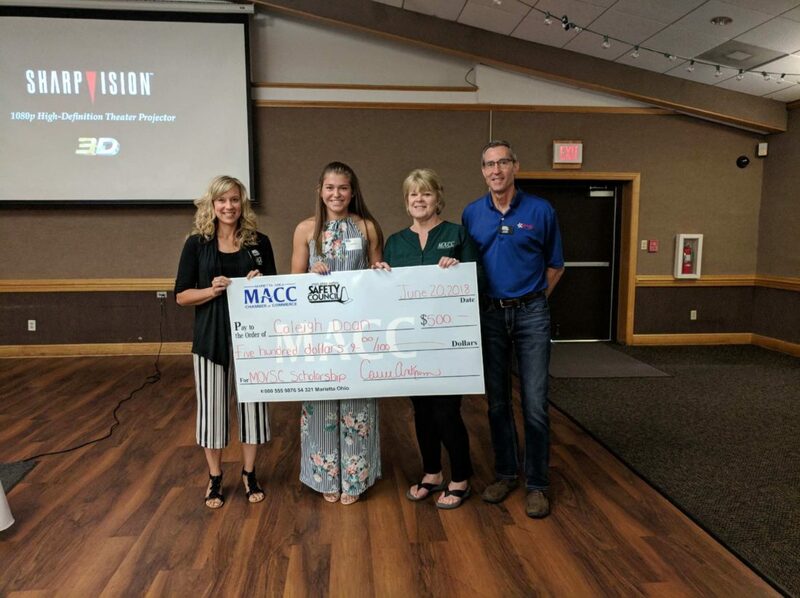 Pictured from left: Carrie Ankrom, MACC president; Caleigh Doan; Candi Heiss, Mid-Ohio Valley Safety Council manager; and Joe Wesel, chair of the Mid-Ohio Valley Safety Council Board of Directors. The Mid-Ohio Valley Safety Council announced last week the first recipient of the MOVSC Scholarship Program. Caleigh Doan, a recent graduate of Marietta High School, was presented a $500 check to apply towards her continuing education. The Scholarship Program was launched from the award money from the 3rd place title for the 2016 Safety Council of The Year through the Ohio Bureau of Workers Compensation. The MOVSC Board of Directors goal is to grow the fund with the recent title of 2nd Place Safety Council of the Year title for 2017. Established in 1988, the MOVSC is co-sponsored by the Marietta Area Chamber of Commerce and the Ohio BWC.